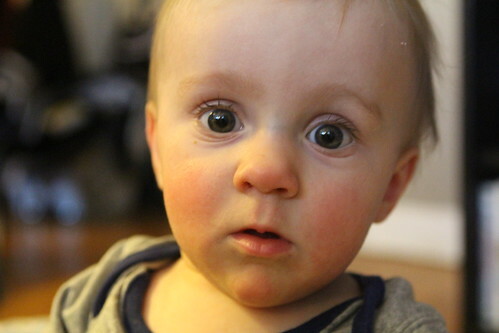 Elliott seemed to lose his mind in the very early hours of the morning last night. After tag team matches of feeding him and snuggling him I eventually took him out onto the couch to sleep thus giving Jen the chance to get some sleep. She must have been really tired because she seemed to have no idea that it even happened by the time she woke up in the morning. It quite cold today with temperatures in the thirties so I suspended any hope for spring cooking and got to work this afternoon making something warming since temperatures were going to plunge into the twenties this evening. To warm up Jen after a long walk home in the cold I made this sweet onion soup. 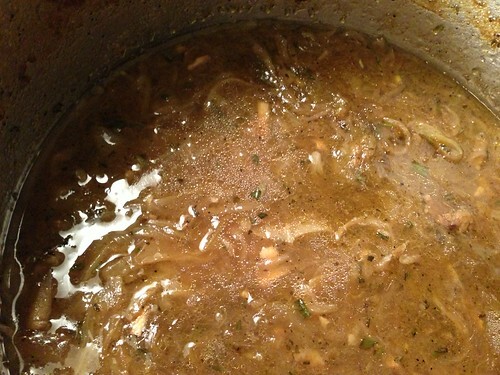 I cooked down some garlic, shallots, and sweet onion in butter and olive oil then added the braising liquid from our lamb shanks a couple of weeks ago. At the end I tossed in some fresh chopped rosemary. For the first time in the history of the blog I somehow forgot to take a picture of the finished product. 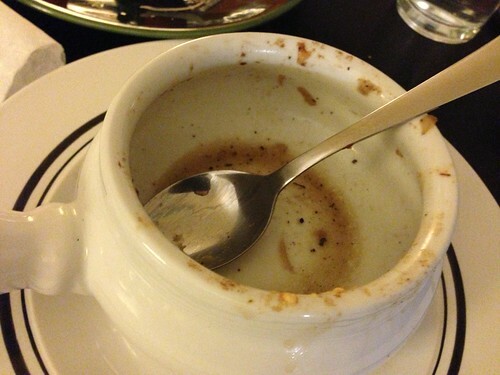 Imagine this bowl filled with delicious onion soup and topped with a slice of stale ciabatta and a mixture of shredded Parmigiano-Reggiano, Cantillon, and Meule de Savoie cheeses. Imagine the cheese perfectly browned under the broiler. It looked and tasted that nice! Martin woke up this morning with extremely rosy cheeks and nose. This of course meant that we Googled what it could be and returned all sorts of horrible childhood diseases that he could be suffering from. Occam's razor would dictate that he was just teething but thanks to Google no one ever draws the most likely conclusion. It is most likely that he has Fifth's Disease. No need to consult a doctor. 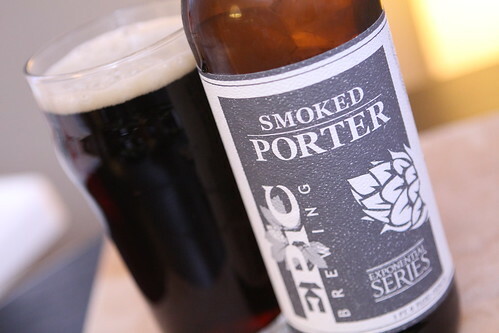 To go with the onion soup I opened this Smoked Porter from Epic Brewing which Jen brought home from her Utah trip back in January. This was a really nice porter. It was very subtly smoked and, despite the claim on their website that they only brew high alcohol beers, only came in at 5.8% ABV. It was very easy to drink the bomber with dinner and not fall asleep on the couch. Well, at least not instantly anyway. Today was a momentous day because Martin learned how to clap about a month after Elliott started doing so. He was quite pleased with himself clapping all the way to daycare this morning, then in his crib, and at the dinner table as we ate our soup. It's amazing to imagine how great life would be if just clapping your hands together could give you the sheer, unbridled joy that it seems to bring to a baby. The life of a baby is a sweet one indeed.